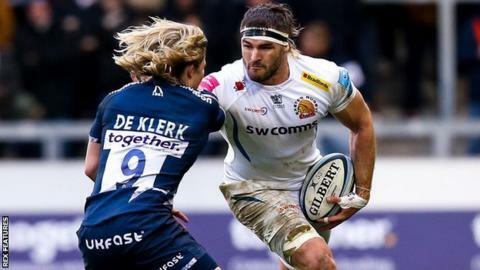 Exeter Chiefs stayed top of the Premiership with a narrow victory over Sale Sharks at the AJ Bell Stadium. The Chiefs looked set for a comfortable win when first-half tries by Ollie Devoto and Don Armand helped to put them 15-0 up at the break. But two tries in the final quarter from Sam James and Will Cliff put a different complexion on the scoreline. And it was only replacement flanker Sean Lonsdale's try sandwiched in between which earned a Chiefs victory. Exeter's 12th win in 15 Premiership games was launched by Gareth Steenson's early penalty. From a break by full-back Santiago Cordero, centre Devoto then went in for their first try, Steenson adding the extras for a 10-0 lead. And the Chiefs got their second try when flanker Armand scored two minutes before the break, Steenson just missing with the conversion attempt. After a scoreless third quarter of the game, Sale got right back in the game when full-back James crossed on 63 minutes, Faf de Klerk converting. Lonsdale then hit back to restore the Chiefs' two-score cushion, only for Cliff to go over again, converting to lift his side back to within six points. But, in the end, it was only sufficient to earn a losing bonus point. "There was a lot of effort, a lot of blood but the side that made the fewest mistakes probably just got it in the end. "We line broke quite well in the first half, but we just couldn't finish them off and they got the rub of the green with the bounce. "We're at the races. That's the important thing. I'm not that disappointed, but I will have a pint tonight over the bonus-point and have a look at the performance of the referee tomorrow. "They're a good side and anybody who doubts them does so at their own peril. They know how to grind a game out, they're good at the dark stuff and better than us at that." "You don't want to prepare for tight games because you want to try and win nice games of rugby, but the reality is that this was a ding-dong battle like we've had here for a number of years. "I'm really pleased that we showed enough character to see the game out. There were a huge amount of really big collisions and it was two fully-committed sides. "It felt like a pretty even contest where it was going to be shaded by one or two moments and fortunately we created those moments a little bit more than Sale did." (On incident involving late clash of heads between Exeter flanker Dave Ewers and Sale scrum-half Will Cliff): "I spoke to Steve Diamond outside and as far as he's concerned it was completely fine and a rugby incident. The ball was in the middle of it and they've just collided. Fair play to Steve, he's seen it much like I have." Sale: L James; Solomona, O'Connor, Van Rensburgh, McGuigan; S James, De Klerk; Morozov, Webber, John, Evans, Phillips, Ross (capt), B Curry, Strauss. Replacements: Langdon, Neild, Bristow, Jones, Ostrikov, Cliff, Redpath, Reed. Exeter: Cordero; Cuthbert, Whitten, Devoto, Woodburn; Steenson, White; Hepburn, Yeandle (capt), Holmes, Dennis, Hill, Ewers, Armand, Kvesic. Replacements: Taione, Keast, Street, Lees, Lonsdale, Maunder, J Simmonds, Hill. For the latest rugby union news follow @bbcrugbyunion on Twitter.